You can install it in the corner of any room without taking any special technical measures. The normal hands on regular flat clocks formed the basis for the development of this clock. The hands of the TRIACHRON seem to move magically, attracting the eye of the observer. Especially the fast-moving second hand of this timepiece makes it obvious why clock movements are so fascinating. A complex curved mechanism with a forced control was developed for the very intricate clock hand control mechanism. 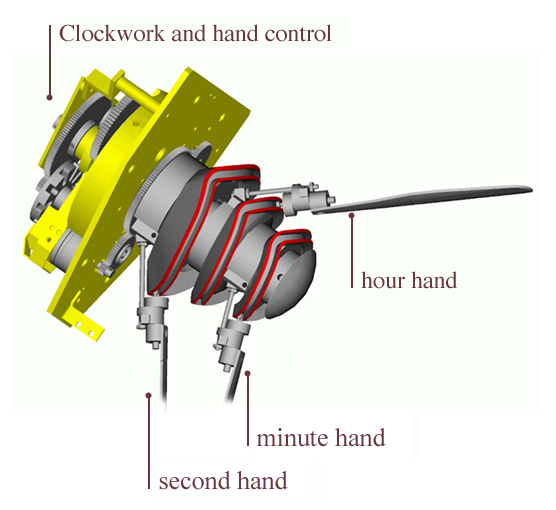 It controls each of the hands of the clock on 2 axes to keep the hand surfaces parallel and at a constant distance to the 3-dimensionsal face of the timepiece. The clock hands move through the three corners and rotate along their own longitudinal axis keeping on the corner angle. A proven and reliable mechanism was developed based upon innovative ideas to ensure a long service life. The clockwork with the clock hand control is built of high-quality components. All of the curved tracks are hardened, all of the rotating and pivoting movements are on ball-bearings and all toothed gears are made of steel. Optional a radiocontrolled Clockwork is also avialable. The clock hands are set completely automatically with the DCF77time/signal transmitter. Even in the event of a power failure, this function allows you to correct it automatically with the semi-annual time change-over and daily time synchronization with atomic clocks.